This is a guest article by Dan Inocencio. A few weeks ago, there was a post on the AZMagicPlayers Facebook group questioning the reasoning behind the prevalence of playing top tier decks in nearly all events, and the lack of brews in the even more casual events here in Arizona. Reading from the comments, I was dismayed at the views from a few that brewing is somehow a casual thing, belonging only on the kitchen tables or in EDH, and that events are for top tier decks. I wholeheartedly disagree with this particular sentiment that brews are not important at tournaments. Don’t get me wrong, I am a competitive player, and I love winning. Due to my job time constraints I tend to keep a low profile, but if time permitted it, I would be at tournaments far more regularly than I am now. I will regularly play “tier” decks in all formats I play in, currently running Infect in Modern and Lands in Legacy (I tend to avoid Standard, although I have been known to occasionally play some weird things from time to time for the odd FNM). I love the concept of brewing, building, and tinkering with new decks. Pushing deckbuilding to its limits and experimenting with new ideas is vital to the health of all formats. After all, even “tier” decks have to start from somewhere. In Modern, Grishoalbrand exploded in popularity in mid-2015, however Kurata Shintarou had been playing it in Japan back as early as October 2014. Modern Lantern Control took down GP Oklahoma City 2015, but the original concept had been floating around with MTG Salvation user Zerodown since as early as 2012. Every deck has a story on how it got to where it is today, and for many decks, there are many unsung heroes working to make many of these ideas competitive reality. I myself enjoy tinkering with rogue decks and helping in their development. In Modern I have tried messing with Tezzerator after the Thopter-Sword unbanning, and Bant Knightfall after Retreat to Coralhelm was revealed. (Incidentally Bant Knightfall has just recently had a major success in taking 3rd at GP Guangzhou 2016). I’ve even tried making a competitive Modern “Lands-esque” Loam deck. Some decks I’ve found some success, some I haven’t, but that doesn’t deter me. Winning games is sweet, but nothing is sweeter than taking down a tournament full of established decks with a rogue brew, demonstrating not only your gameplay skills, but your constructed deckbuilding prowess as well. I myself have been fortunate enough to experience such success in what is now probably my favorite format to brew new decks in: Vintage. We are lucky in Arizona to have a pretty healthy Vintage community, especially with the allowing of proxies in many tournaments. There are regular tournaments, the AZ Vintage League, as well a community full of talented, and helpful individuals. To help give a sense of the power of brewing in Vintage, I’d like to tell my story of how I first started playing Vintage, built my own deck from scratch, and manage to win it all. I first played Vintage when I participated in the 3rd season of the AZ Vintage League at the urging of Matt Shaffer, who runs the tournament and first sold me a Tabernacle at Pendrell Vale that sent me down the path of playing Eternal Formats. For those unfamiliar with the league, it is a 15-20 proxy Vintage tournament set over the course of eight weeks— one match per week, and after that there is a cut to Top 8. We were allowed to change our decklists twice at set points midway through the season should we so desire. Some use this as a chance to play entirely different decks and try out new things, others use it to tweak and refine their deck. Due to the slow pace of the tournament, it seems to have a more casual feel to it, unlike say the endurance test feel of a PPTQ or GP, however that does not mean that the competition is not fierce. It provided me with a gauntlet of decks ranging from Vintage regulars, such as TPS, Shops, Dredge, Oath and Planeswalker Control, to more fringe decks such as Flash-Rector. Even the stakes were relatively high with a $20 dollar buy in: Top prize was an Expedition Wasteland, 2nd place was an Expedition Strip Mine, and 3-4 were Expedition Forbidden Orchards. I didn’t know too much about Vintage at the time, but I knew I liked the concept of Shops. I also wanted to stay with something I was comfortable with since I was already far out of my element. I predominantly play Lands in Legacy, so the concept attacking my opponent’s resources while speeding out a Dark Depths combo was comfortable place for me. So to me, a Shops-Depths deck seemed like a match made in heaven—except it didn’t really exist at the time. It wasn’t one of the best version of shops or even a well-tested version of Shops, so there were pretty much no resources on it. I later learned that a player in Denmark named Niels Thiim had brewed up something similar and had some online success with it, but for the time I was stuck. I had some basic knowledge on how many of the major Vintage decks work. For instance, I knew that Shops have some of the best tools to lock down the board and attack mana, so I had found my basic lockdown package of Sphere Effects, Tangle Wires, Phyrexian Revokers and Lodestone Golems (this was before the restriction). For building this deck, it was more a matter of finding a solution on how both to execute and protect the Dark Depths combo. When playing in a format with a suite of the most powerful cards of all time, I had access to the most powerful tutors around. In Legacy Lands, tutors such as Crop Rotation and Gamble are vital, allowing the suite of toolbox cards as well as finding the combo, so I figured tutors would be the best solution for me here as well. I ran the four best black tutors available to me to fetch whatever I needed at the time, plus expedition maps to fetch any land I needed, relying on Mental Missteps and my lockdown package to protect the tutors. 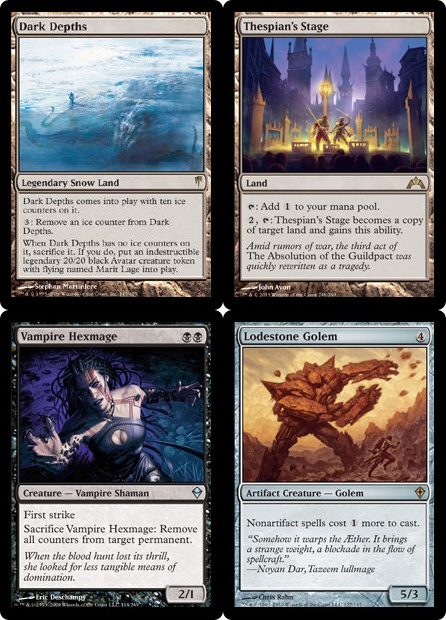 Since I was in black, I also ran Vampire Hexmage for consistency on the combo. Due to the combo and the Wasteland package, this deck is very greedy on lands that cannot produce colors, so I decided to stay mono black to keep the mana base as streamlined as I could, I would need to rely on Urborg for my lands to make black mana, and I didn’t want to hurt consistency by stressing my mana base any further. The goal was simple: Either lock down the board and beat my opponent to death with Lodestone Golems, or stall the game long enough to make a Marit Lage, which typically didn’t take very long due to my robust tutor package. It was a multifaceted plan of attack that aimed at forcing my opponent to deal with my plans simultaneously, all while under resource denial, preventing them from advancing their board state. Since they couldn’t deal with all my threats as well as advance their board state, they would either stall out and die to Lodestone Golem or die to a Marit Lage. The Tangle Wires would act as virtual Time Walks, the Golems acted as both spheres and a clock, and the Pithing Needles and Phyrexian Revokers would take care of anything they could possibly do to advance their game plan, as well as deal with any pesky mana rocks or utility lands. The Wasteland/Crucible lock also provided another path the resource denial. In the sideboard, the Cages helped me deal with both Dredge and Oath. Illness helped with Mentor, as did The Tabernacle at Pendrell Vale, which was also tutorable by my Expedition Maps. Witchbane Orb protected against both Hurkyl’s recall, as well as preventing Storm from winning with Tendrils. My biggest vulnerability at the time was having my Marit Lage either bounced by Echoing Truths, so I usually tried to set my Chalice of the Void on 2 on matches I was expecting it, as well as running Crucible of Worlds to reload the combo. I had no idea whether this list would work well or not, but my initial testing was promising. I had no idea that the deck would be as successful as it was. Over the course of the season, I made minor tweaks here and there, but the core of the list stayed the same. This rogue list led me to a 9-2-0 match record overall and ultimately winning the third season of the AZ Vintage league, beating Sam Wolloch on Merfolk. For the final match I relied on my Vampire Hexmages for the combo with Wasteland backup, and winning the final game by dismembering his Phantasmal Image copying my Marit Lage token, taking the match 2-0. Since the restriction of Lodestone Golem, the deck took a massive hit in its efficacy, especially against the Gush Mentor deck that have been popular lately, but I am still committed to making Shops-Depths a thing in the post Golem world. Meta games change and decks will have their ups and downs, but a part of brewing is looking to exploit gaps within the metagame. In the meantime, I have also moved onto other projects Modern, Legacy, Commander and another really cool idea for Vintage that I have high hopes for and will play in the next season of the Vintage League. I feel that Vintage can get an unfair reputation within the magic community due to the sheer number of powerful cards that can lead to quick and easy combo wins like Key-Time Vault, and Tinker-Blightsteel. Those are just side effects of playing with nearly every card printed in Magic’s 23-year history. The reality is: yes, those combos are threats, but they are definitely not the main event, especially when you have both solutions as well as major threats of your own. There is an established metagame, full of diverse strategies ranging from fair decks like Fish, to crazy combo decks like TPS. However, unlike modern and standard, it is possible to interact with even the most un-interactive linear decks to some extent. You can disrupt their resources, you can disrupt them on the stack, you can disrupt them on the battlefield. People complain about un-interactive decks, but in Vintage, you can FORCE interaction. Like Legacy, Vintage rewards players for familiarity of the deck they are playing and even within the same deck archetype, there are numerous flavors that you can have. For instance: there is no definitive “Shops” deck, it could be Martello Shops, or Aggro Shops, or Welder Shops, or Terra Nova, or now Shops-Depths. Because the card pool is so large and the player base is so small in comparison, I would hesitate to call Vintage truly a solved format. Vintage is a fantastic format to brew and tinker in because the sheer power of many of the cards exclusive to the format help smooth out consistency issues that can be found on more Johnny-esque rogue brews. Combos that can be seen as inconsistent are boosted by the most powerful draw engines in the game. Decks that are considered too slow can be boosted by the abundance of fast mana that can be found everywhere. Decks relying on critical pieces can be boosted the abundance of tutors and the amount of immensely powerful lands can create strategies that are completely unheard of in other formats. Vintage truly is a brewer’s paradise. I highly encourage everyone to give brewing and deck tinkering a shot, even if it isn’t in Vintage. It provides a new dimension to magic and overall strengthens your ability as a player to recognize deckbuilding choices and what makes a good deck in general. That can pay off when it comes to interacting with opponents, or sideboard choices. You learn to recognize the strengths and weaknesses of various deck types and archetypes. I also recommend though that everyone also give Vintage a shot. It’s a fun format to both play and brew, and with proxy tournaments such as the AZ Vintage League, there isn’t that high of a barrier of entry than you would think. Additionally, with the advent of Kaladesh, Vintage got a surprising number of new toys to play with, which should make the coming months an exciting time for Vintage brewing. I myself am working on a deck that utilizes Kaladesh cards to transform an age old gimmick deck into a Storm powerhouse that I hope to play at the next AZ Vintage League. Hopefully, I’ll see some new faces and decks there.